Are you one of those pet owners who wouldn’t even think of NOT having a stocking on the mantle for your four-legged family members? Does your pet have more packages under the tree than your spouse? The truth is, most of us love our pets...and that love often manifests itself in indulgence! I spent twenty minutes last weekend picking up dog toys scattered about my house and pointlessly placing them back into their proper place. Within minutes my floor looked like the toy aisle at a pet specialty store... a sea of Busy Buddy® toys! My dogs love their toys, and that is a good thing. I’d much rather have them chewing on a Squirrel Dude™ than on my baseboards! Studies have shown that the mere presence of a toy in a kennel makes an animal more highly adoptable! But, for many shelters there just aren’t sufficient resources to provide for the animals’ psychological needs. That is where PetSafe comes in! During the month of December, we are offering Facebook users an opportunity to provide toys for animals in shelters across the country. 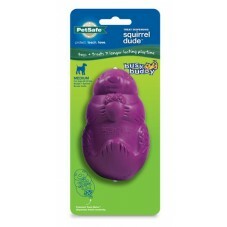 For every new “Like” on the PetSafe Facebook page, a toy will be donated to a participating shelter. Toys will be shipped out in early January making for a Happy New Year for homeless pets! We have a great model showing off a small portion of toy donations! Additional agencies are being signed-up for the promotion. Giving a behavior-enriching toy to a shelter dog is only a mouse click away. Please visit our Facebook page: https://www.facebook.com/PetSafeBrand and click “Like”. PetSafe is prepared to ship up to 15,000 Busy Buddy toys to participating shelters! We are thrilled to be able to support the important, life-saving work happening in animal shelters across the country. The agencies partnering with us in this promotion are always looking for opportunities to do even more for the animals in their care. PetSafe is proud to play a small role in making their temporary homes a little brighter. Happy Holidays! Now go “Like” PetSafe on Facebook and give a dog a toy!